Dr Gillian McKeith's organisation has had to detox its own products after MHRA officers discovered it was advertising and selling goods without legal authorisation whilst making medicinal claims about their efficacy. 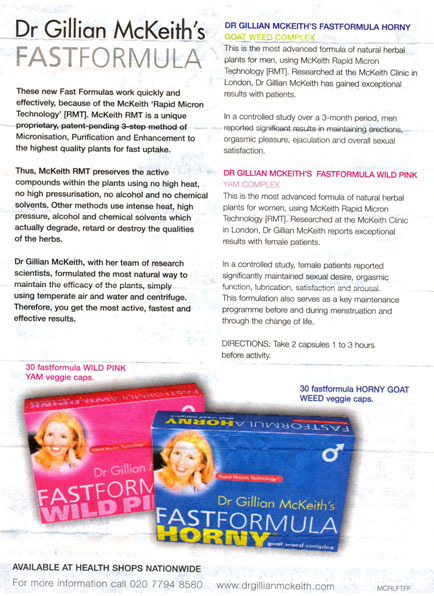 Dr McKeith's products, ‘Fast Formula Wild Pink' for women and ‘Fast Formula Horny' for men promised to deliver wonders for all in the bedroom. The MHRA determined that both products were medicines because of the presence of some well-known medicinal herbs and because of the claims being made by Dr McKeith's organisation. Only licensed medicines may be advertised to the public. David Carter, Manager of the Medicines Borderline Section said "Companies who place products on the market have a clear duty to ensure that those products comply with all relevant legislation. As Dr McKeith's organisation had already been made aware of the requirements of medicines legislation in previous years there was no reason for all the products not to be compliant with the law. The MHRA has a comprehensive website with information on the legislation it administers, including the law on herbal products. Furthermore, free advice on the likely status of products is available from staff in the Medicines Borderline Section. It would have been a very simple matter for them to have sought our opinion." See below for original product information leaflet.